Heart attacks, or myocardial infarctions, occur when a thrombus – or clot – blocks a blood vessel in the heart. In order to treat heart attacks, doctors often perform surgery to introduce a catheter to the blood vessel, allowing them to physically break up or remove the thrombus. But not all patients have quick access to surgical care. And more damage can occur even after the blockage has been removed. That’s because the return of fresh blood to tissues that had been blocked off can cause damage of its own, called reperfusion injury. Reperfusion injury can cause scarring, stiffening cardiac tissue and limiting the heart’s normal functionality. To address these problems, researchers have developed a solution that relies on porous nanogel spheres, about 250 nanometers in diameter, which target a thrombus and deliver a cocktail of two drugs: tPA and Y-27632. A thrombus can be made of various substances, such as platelets or arterial plaques, but they all contain a substance called fibrin. So, to target blockages, each nanogel is coated with proteins that bind specifically to fibrin. In other words, when the nanogels reach a thrombus, they stick. The tPA and Y-27632 are layered inside the nanosphere, with the tPA forming a shell that surrounds the Y-27632. As a result, the tPA leaks out first at the thrombus site, allowing it to do its job – which is to break down fibrin and dissolve the clot. As the tPA is released, the Y-27632 escapes the nanogel. While the tPA targets the clot itself, the Y-27632 aims to limit the damage caused by reperfusion injury. It does this by limiting the rigidity of the cells in the area that contribute to scarring. This allows these cells to retain more of their plasticity, improving their ability to function normally and preserving more cardiac function. In in vitro testing, the researchers found that the targeted tPA/Y-27632 cocktail dissolved clots in a matter of minutes. While this has yet to be tested in trials, it may work more quickly than surgical interventions, which require time to prep the patient and get the catheter in place. In tests using laboratory rats, the researchers also found that their technique limited scarring and preserved heart function after heart attack better than targeted tPA or Y-27632 by themselves – and far better than a control group in which animals received neither drug. Specifically, animals that received the targeted cocktail had a left ventricular ejection fraction, which measures a heart’s functionality, of around 67 percent four weeks after the heart attack – which is healthy. The tPA by itself was around 57 percent, which is at the low end of the normal range, while both the control group and Y-27632 by itself dipped into the 40s. Similarly, the targeted cocktail resulted in scar tissue across less than 5 percent of the affected area. The tPA and Y-27632 had scar tissue across approximately 7 percent of the area, with the control group seeing scarring across more than 10 percent. What’s more, the researchers found that the targeted nanogels resulted in little or none of the nanogels being found in other tissues – such as the lungs and liver – particularly when compared to the use of the non-targeted nanogels. One other benefit of the targeted nanogels is that, due to their small size, they can target even those blood vessels that are too small to reach using catheters. The researchers also note that this is a preclinical study. Next steps for the work include further evaluating the safety of the nanogels and testing in larger animal models. The paper, “Targeted Treatment of Ischemic and Fibrotic Complications of Myocardial Infarction Using a Dual-Delivery Microgel Therapeutic,” is published in the journal ACS Nano. Co-lead authors are Emily Mihalko, a Ph.D. student in the joint BME program, and Ke Huang, a Ph.D. student at NC State. The paper was co-authored by Ke Cheng, a professor of biomolecular sciences at NC State and a professor in the joint BME program, and by Erin Sproul, a former postdoctoral researcher in the joint BME program. All of the study authors are members of the Functional Tissue Engineering group of the Comparative Medicine Institute (CMI) at NC State, which facilitated this interdisciplinary collaboration. The work was done with support from the NC State CMI; the National Institutes of Health, under grants HL123920 and HL137093; and the National Science Foundation under grant ECCS-1542015. Abstract: Myocardial infarction (MI), commonly known as a heart attack, affects millions of people worldwide and results in significant death and disabilities. A major cause of MI is fibrin-rich thrombus formation that occludes the coronary arteries, blocking blood flow to the heart and causing fibrin deposition. In treating MI, re-establishing blood flow is critical. However, ischemia reperfusion (I/R) injury itself can also occur and contributes to cardiac fibrosis. 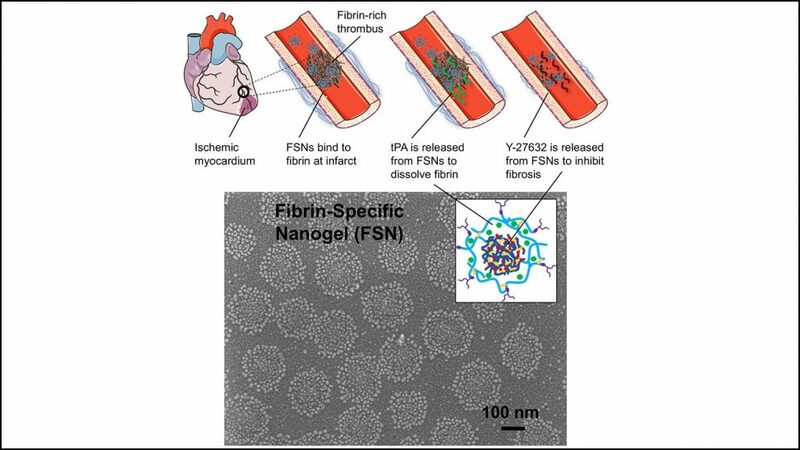 Fibrin-specific poly(N-isopropylacrylamide) nanogels (FSNs) comprised of a core–shell colloidal hydrogel architecture are utilized in this study to design a dual-delivery system that simultaneously addresses the need to (1) re-establish blood flow and (2) inhibit cardiac fibrosis following I/R injury. These therapeutic needs are met by controlling the release of a fibrinolytic protein, tissue plasminogen activator (tPA), and a small molecule cell contractility inhibitor (Y-27632). In vitro, tPA and Y-27632-loaded FSNs rapidly degrade fibrin and decrease cardiac cell stress fiber formation and connective tissue growth factor expression, which are both upregulated in cardiac fibrosis. In vivo, FSNs localize to fibrin in injured heart tissue and, when loaded with tPA and Y-27632, showed significant improvement in left ventricular ejection fraction 2 and 4 weeks post-I/R as well as significantly decreased infarct size, ?-smooth muscle actin expression, and connective tissue growth factor expression 4 weeks post-I/R. Together, these data demonstrate the feasibility of this targeted therapeutic strategy to improve cardiac function following MI. As a student, Park Scholarships alumnus DeShawn Brown found himself looking for ways to combine his interest in computer science with his entrepreneurial passion. 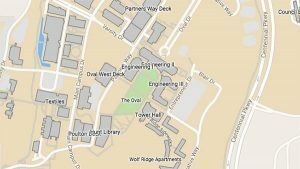 He formed a study group with two of his classmates, which has now become Lithios, a leading mobile application development firm in the Research Triangle, of which Brown serves as CEO and founder.